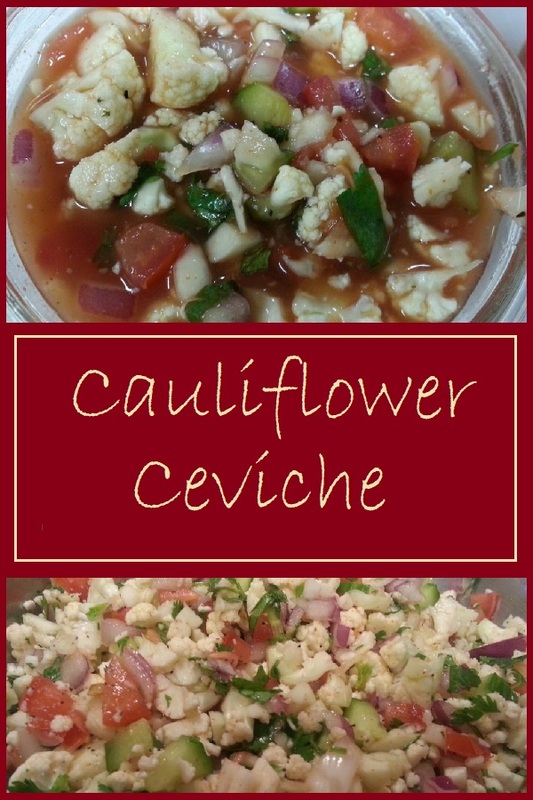 Cauliflower Ceviche was inspired by the green grocer who comes to my work. I was telling him that I was eating vegan for a month, and he asked if I had ever made ceviche with cauliflower. Of course, I was intrigued by the idea, and asked him for details. All of the suggested ingredients were vegetables that I really enjoyed, so I decided to give Cauliflower Ceviche a try. So, this time, I didn’t win over the carnivores, but even with his complaint, he said that he liked it. He would just prefer that I called it something else, perhaps, “cauliflower salad,” or I could add some shrimp. Adding shrimp sort of defeats the whole lets eat vegan for a month challenge, so I had to tell him it wasn’t happening. Aside for the chopping time, this recipe is very simple. The hardest part is waiting for the cauliflower to marinate in the lime juice and time for all of the flavors to combine after the Cauliflower Ceviche is finished. This can be served with tortilla chips for dipping, or on a vegan tostada shell spread with mayonnaise and topped with sliced avocado. Or, if you prefer, you can eat it from a bowl with a fork as a salad just like Baker’s Man. However you serve this, Cauliflower Ceviche is light and refreshing. It will be a great addition to our summer dinner menus, and when our 30 days of vegan are finished, I might even add shrimp to it for Baker’s Man. 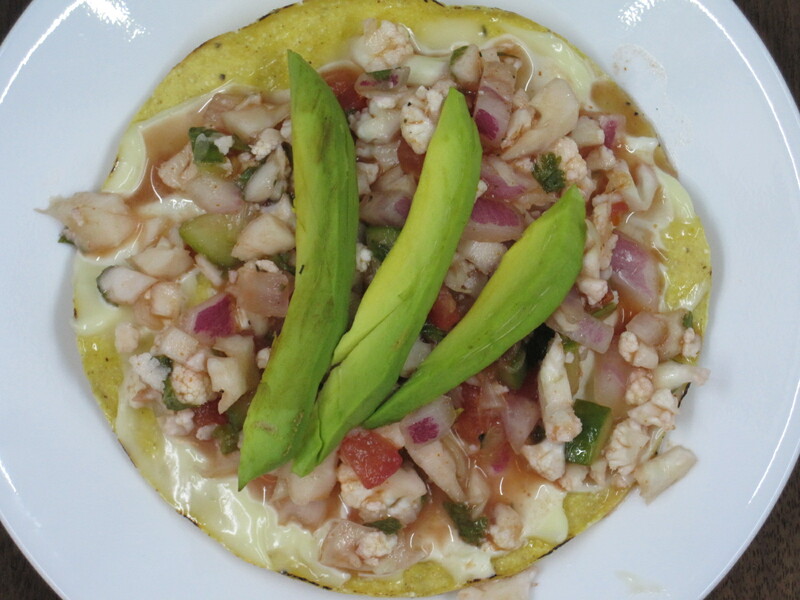 Giver our recipe for Cauliflower Ceviche a try and let us know what you think by leaving a comment below. This is a simple and light vegan ceviche. 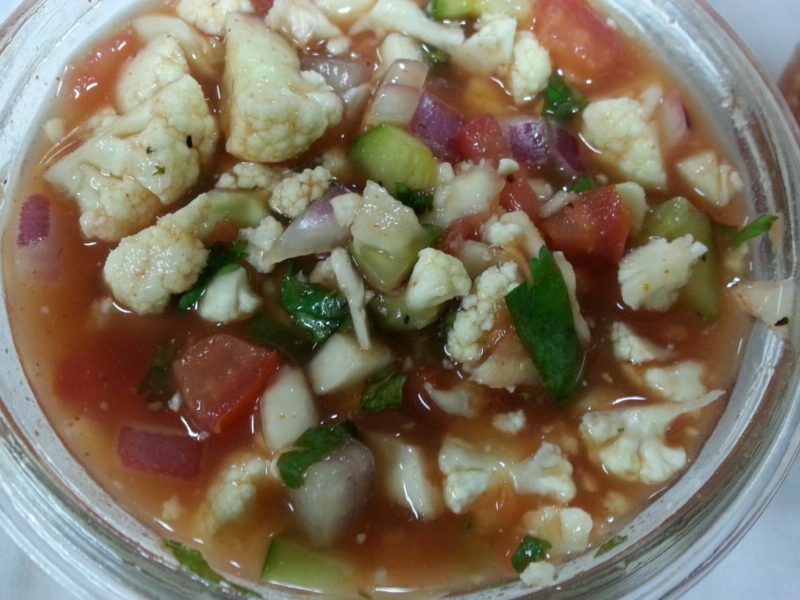 Cauliflower pairs well with onions, cucumbers, tomato, lime, and cilantro. If you're feeding children, or adults who don't like heat, leave out the jalapeno and hot sauce. The hot sauce can be added to individual servings. The total cost of this recipe is best part of this is $3.67 or about $0.46 for a very generous 1 cup serving, but the best part that it's so low in calories that you can eat the whole thing yourself. Mix cauliflower, onion, and lime juice and allow to soak for at least 30 minutes or up to 4 hours in the refrigerator. 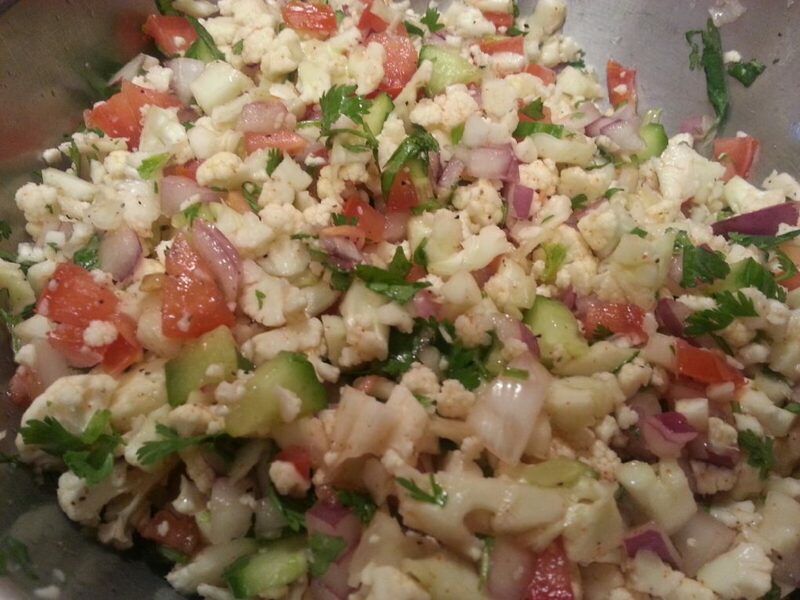 Chop cucumber, and tomato and add to the bowl with the cauliflower and onion mixture. Add chopped cilantro to bowl with cauliflower mixture. Sprinkle salt, pepper, and hot sauce (if using) on top of vegetable mixture. Allow to chill in the refrigerator for 30 minutes to allow flavors to fully combine. Nutritional Information is calculated based upon 1/8th of the recipe above (about 1 cup serving) prepared as written.